Cannibal Corpse new album is out on Metal Blade Records on September 16th, 2014. Visit their site for more details. Lucky number thirteen? Lucky or not, it’s a quantity of releases (not even counting VHS/DVD releases and EPs) and a wealth of material beyond which most bands could even imagine. 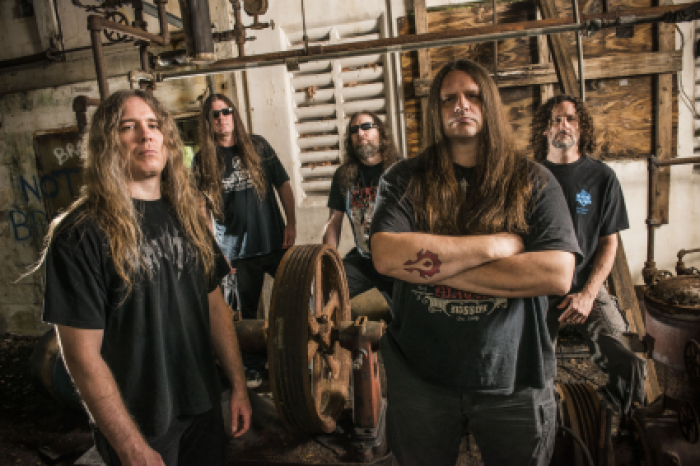 Cannibal Corpse approaches each recording session with a honed and precise vision of a band in their third decade of existence. With this new entry to their extensive catalog, they have switched gears, opting to work with producer Mark Lewis at Audio Hammer Studios, after having tracked their previous three (Kill, Evisceration Plague, Torture) with Erik Rutan. Mark Lewis is a name metal fans have surely heard at this point; he has produced recent albums from The Black Dahlia Murder, DevilDriver, and many more. Sonically speaking, the result this time around is a massive, belligerent, and deliberate aural attack. Alex Webster, along with O’Brien, Barrett, and Mazurkiewicz, are all accomplished song writers, that much is no secret. For “A Skeletal Domain,” each member made a significant contribution to the song writing. O’Brien wrote five tracks, Webster wrote four, and Barrett handled two and half (“Asphyxiate to Resuscitate” was co-written with Mazurkiewicz). Alex Webster describes the band’s song writing proficiency as a “football team with a lot of roster depth. Any of us could write an entire album, but when we’re working together and putting forth our best material, we get an even better whole record.” That strength is on display in spades, and led to a particularly impressive performance from O’Brien. Mark Lewis raved about the guitarist’s playing: “I don’t think he’s written crazier music than what’s on this album. He’s never written something like on the solo for “The Murderer’s Pact.” Simply put, this is legit guitar playing.” Webster reiterated that this is “one of the most important albums for Pat [O’Brien].” His solos draw on his oft-overlooked neo-classical background while remaining dark enough to fit comfortably within the band’s death metal strike zone. In addition to Pat’s contributions, Paul Mazurkiewicz entered the studio arguably more prepared than ever. Mark Lewis elaborated: “Paul came in so prepared and he hammered the hell out of every song. The drums on this record are not over doctored – the toms aren’t sampled, Paul just HIT HARD.” In addition to his drum performance, Mazurkiewicz’s lyrics continued to weave detail-filled tales of death and disgust. The drummer penned half of the album’s lyrics, with Webster penning four, and Barrett another two to round out the album. The musical and lyrical team effort here laid the foundation for the vocal performance of iconic front man, George “Corpsegrinder” Fisher. For “A Skeletal Domain,” producer Mark Lewis worked to cull the most potent performance from the vocalist as possible. Lewis explains: “The mindset with George was to capture more high screams. We wanted to revisit the “Bloodthirst” days a bit. There’s a violence that lives in his throat that we really wanted to capture.” Evidence of these efforts exists in the violent howls in “Headlong into Carnage,” the title track, album opener “High Velocity Impact Splatter,” and more. Corpsegrinder’s trademark vocals are the final piece of the death metal puzzle that is “A Skeletal Domain.” Cannibal Corpse have proven time and again that they have more fuel in their tank, more riffs in their minds, and more ways to describe gore than any single group of human beings could ever have hoped. The thirteenth album will prove to be as important a landmark in their career as just about any other. Cannibal Corpse are consistency defined.